Global Navigation Satellite Systems (GNSS) is the standard generic term for satellite navigation systems that provide autonomous geo-spatial positioning with global coverage. GNSS allows electronic receivers to determine their location (longitude, latitude, and altitude) to within a few meters using time signals transmitted along a line-of-sight by radio from satellites. Receivers on the ground with a fixed position can also be used to calculate the precise time as a reference for scientific experiments. As of 2009, the United States Global Positioning System (GPS) is the only fully operational GNSS. The Russian GLONASS is a GNSS in the process of being restored to full operation. The European Union's Galileo positioning system is a GNSS in initial deployment phase, scheduled to be operational in 2013. The People's Republic of China has indicated it will expand its regional Beidou navigation system into the global Compass navigation system by 2015. GPS activities started at ASI/CGS in 1991 when a permanent GPS ROGUE-8 receiver was installed and since then it has belonged to the International GNSS Service (IGS). In 1994 six TurboRogue SNR8100 receivers were purchased and the first kernel the Italian GPS Fiducial Network was make up. This network is now made by 12 stations, all delivering RINEX daily and hourly data. A few sites are also delivering real-time streaming in the framework of the EUREF IP project . ASI-CGS has been acting as EUREF NTRIP Broadcaster since 2009, supporting the distribution of RT data/solutions in the European region. All the data from these stations, together with those coming from other sites in Italy, are archived and made available to the users via GeoDAF, EUREF Local Analysis Center since August 1996. 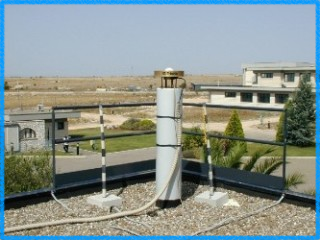 Two permanent GNSS antenna are installed at ASI/CGS. The first, known as MATE, collects GPS+GLONASS data at 30 sec rate in daily, hourly batches, at 1 sec rate in 15min batch and in real-time via NTRIP protocol. The latter, known as MAT1, collects GPS data at 30 sec rate in daily, and hourly batches. They are collocated with humidity , pressure and temperature sensors.